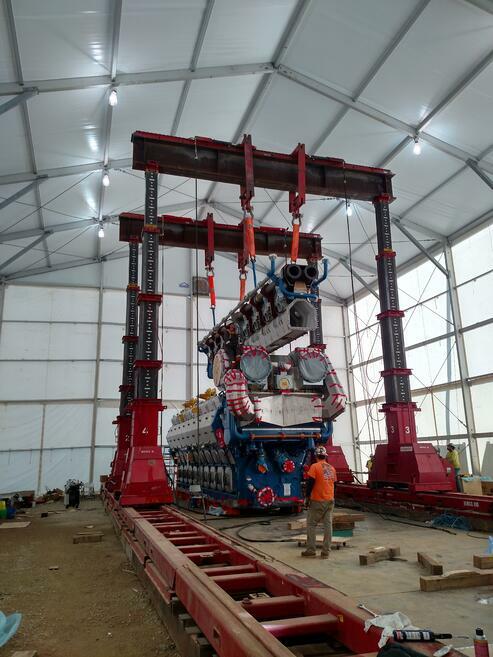 When a power plant needed a shelter large enough to house the world’s largest gas engine and the massive crane needed to assemble it, they knew only a custom solution would do. Structures with a lot of square footage are one thing, but this structure needed to also be at least 36 feet tall to clear the equipment. Another challenge? The structure’s towering profile needed to withstand extreme winds of up to 130 mph. This was no doubt a “tall order” Mahaffey was uniquely equipped to handle. The Texas-based power plant had plans to install a dozen new gas engines. Fully assembled, the engines are more than 20 feet tall, 62 feet long and weigh 360 tons, making them the largest of their kind. The engine is so enormous, it ships in several pieces from the overseas manufacturer. The final product must be assembled on-location using a massive crane. The client required an equally massive temporary clearspan structure to cover the engine components, crane and crew during assembly. Beyond that, the structure needed to have a door large enough to allow crews to remove the fully assembled engines from the structure to place them in their final locations. Mahaffey prides itself on having dedicated, responsive professionals who creatively solve problems. This project was no exception. Creativity and innovation were key ingredients in engineering the perfect solution for this unique project. After evaluating the project’s needs, the Mahaffey team of project managers and engineers decided to modify a temporary aircraft hangar to create the ideal custom structure. Because Mahaffey had all the necessary components in stock, we were able to begin construction right away. 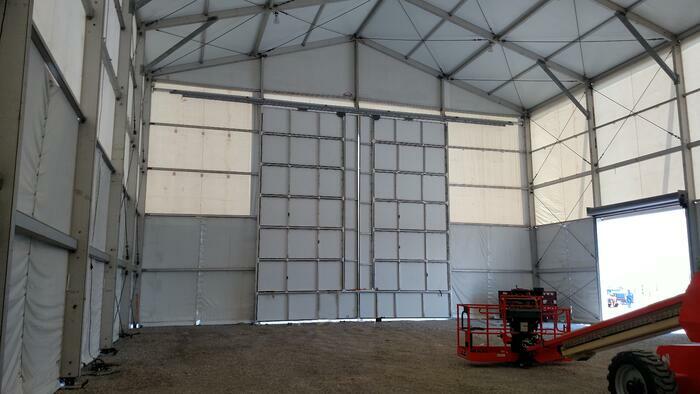 In fact, this custom temporary building was ready to use in under a month from the time of the customer’s call. After modifications, the final structure measured 100 ft. x 66 ft. The tent legs (walls) measured 36 feet high, and the structure peaked at 48 feet. Strong, durable fabric blocked wind from flowing through the building. This fabric also increases wind resistance, particularly in a structure this size. For this or any project, strength and stability are just as important as space and size. Outriggers attached to the frame’s exterior balanced the tall temporary building and provided additional stability. An aluminum box frame with steel inserts further reinforced the structure. A large “barn door” accommodated the engine pieces entering the structure as well as the enormous final products exiting the structure. Amenities including vent fans, a side roll-up door and lighting to complete the facility. “We were able to meet these extreme and unique conditions with some creativity – which is where our team really shines. We combined inventory with ingenuity. It was a great team effort,” said project manager Mark Lewis. A key benefit of temporary structures is complete customization. Why factor in workarounds when you can get exactly what you need? Whatever the size, scope or ground surface, ensure maximum efficiency on your next project by partnering with a provider who can design a temporary or semi-permanent structure that fits your needs. Would you like to learn more about innovative solutions for your business? Contact us today to talk about the possibilities.